NARA M401. Compiled military service records of volunteer Union soldiers belonging to units organized for service from the State of North Carolina. Compiled service records consist of a jacket-envelope for each soldier, labeled with his name, rank, unit and card numbers. 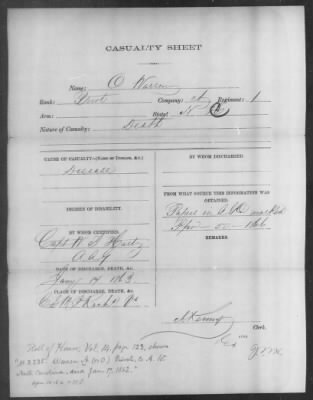 The records typically include card abstracts of a soldier's original muster and hospital rolls, descriptive books, lists of deserters, returns, notational cards, and possibly enlistment papers, casualty sheets, death reports, prisoner of war papers, and correspondence.